York University Professor Hassan Qudrat-Ullah has authored a new book on sustainability in supply chain management. The book, titled Innovative Solutions for Sustainable Supply Chains (2018), is published by Springer. The book presents the latest tools, techniques and solutions that decision makers use to overcome the challenges faced by their sustainable supply chains. Given the ever-increasing significance of socio-economic and environmental factors, the management of sustainable supply chains has become a complex and dynamic task. Multiple and conflicting objectives of stakeholders including suppliers, manufacturers, service providers and retailers add to the complexity of decisions that modern day managers of supply chains face. With the unprecedented technological developments and innovations at hand, sustainability can be maximized for all the activities of a supply chain including: service concept and product design, material sourcing and procurement, manufacturing processes, delivery of the final product and end-of-life management of the product. Consequently, the sustainable supply chains’ problems require a systematic and integrated approach. Modeling and simulation, in general, as well as system dynamics and agent-based modeling have the capabilities to deal with the complexity of sustainable supply chain related problems. In the book, Qudrat-Ullah presents some key findings and insights based on the perspectives described and model-based solutions applied to address various issues related to the design, development, growth, and profitability of sustainable supply chains. It took more than two years from a concept to the finished manuscript to get this volume in print, he says, noting that it draws on the contributions of several colleagues who worked with Qudrat-Ullah during the writing of this book. His research on how to improve people’s decision making in complex, dynamic tasks was also helpful in generating the book’s initial concept. Currently, he is working on two research projects. The first involves improving human performance in dynamic tasks, and the second focuses on climate change and energy dynamics in the Middle East. 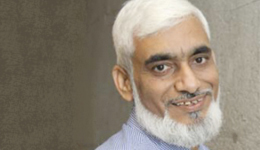 Qudrat-Ullah is a professor of decision sciences with School of Administrative Studies at York University. Teaching and learning are his passions. He is a well-known scholar in decision sciences and energy policy area. He has authored more than 80 refereed publications including six books which are adopted by many graduate schools in the world. In 2017, he won York University’s Faculty of Liberal Arts and Professional Studies’ Excellence in Research Award. He is also a member of the academic council of a Swiss University: Monarch Business School and a director of the board of Swiss Federation of Private Business Schools, Switzerland. Qudrat-Ullah has been honored as a State Guest of Pakistan in 2016 and 2017.